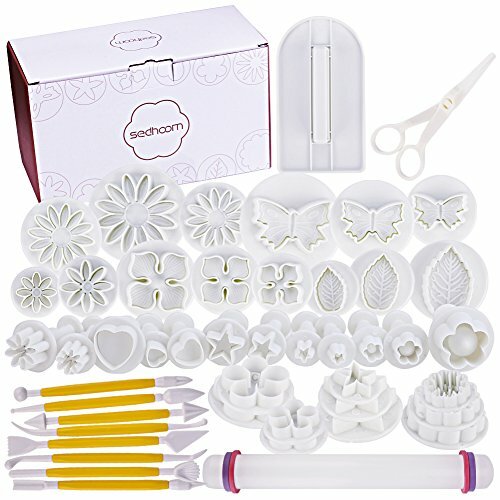 Fondant tools with 36 icing plunger gumpaste cutters (also call it fondant molds,fondant cutters,fondant cake cutters or cake cutter molds)and 8-piece modeling tools, you can be a cake master by creating different cake patterns like flowers,leaves,butterflies and stars. You will enjoy the fun of DIY you own cakes. These are especially designed for you to make beautiful cakes. Do not clean fondant cake cutters and other accessories under the water above 176℉. The 8-piece modeling tools are sharp. Please be careful when using them. Choking hazard. Please keep this product away from children. If you find any cutter parts has been missed or damaged at the first time you open the package, please contact us. ENJOY FUN OF DIY: Making the cakes with your family members. Get together to enjoy the fun of DIY. HEALTHY AND RELIABLE: Food-grade plastic, absolutely safe for your health. Easy to use and clean. MORE CUTTERS: With 36 icing plunger cutters and 8-piece modeling tools, you can create different cake patterns like flowers,leaves,butterflies and stars. MORE ACCESSORIES: 47 accessories, contains 36 icing plunger cutters, a fondant smoother, 8-piece modeling tools, a rolling pin and a flower lifter. Ideal choice for fondant, cake decoration, marzipan etc. GUARANTEE: We stand behind our products 100% with a 12-MONTH warranty. We do offer a 30-DAY money-back guarantee on all orders to allow you to test the suitability of our product. Feel free to contact us if you have any issues with the product. If you have any questions about this product by Sedhoom, contact us by completing and submitting the form below. If you are looking for a specif part number, please include it with your message.